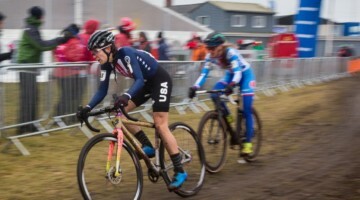 When you win the USA Cycling Cyclocross National Championships nine times, it’s understandable that the world’s only cyclocross magazine and website profiles your bikes quite a number of times as well. 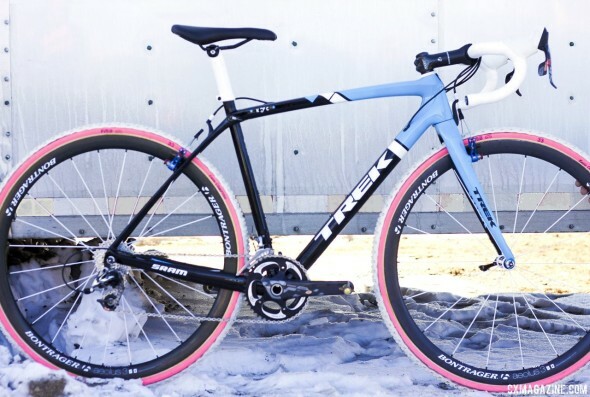 We’ve geeked out over Compton’s past bikes over the years, which have included models from Primus Mootry, Stevens and Giant, along with her 2013 National Championship-winning Trek aluminum prototype, this season’s Trek Crockett, and her Boone debut on January 1. Compton’s new bikes differ greatly from Sven Nys’ Trek Boone bikes not only in size and color scheme, but in component and brake selection. 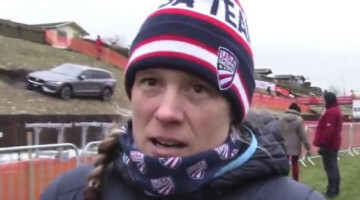 Compton has been racing cantilevers, and is sponsored by SRAM and thus rides SRAM Red components, while Nys has always used Shimano. The two champions share the same wheel and cockpit choices, but differ even in tire brands. See the slideshow on the next page for detailed photos of the bike Compton will race in the 2014 Cyclocross National Championships in Boulder, Colorado. 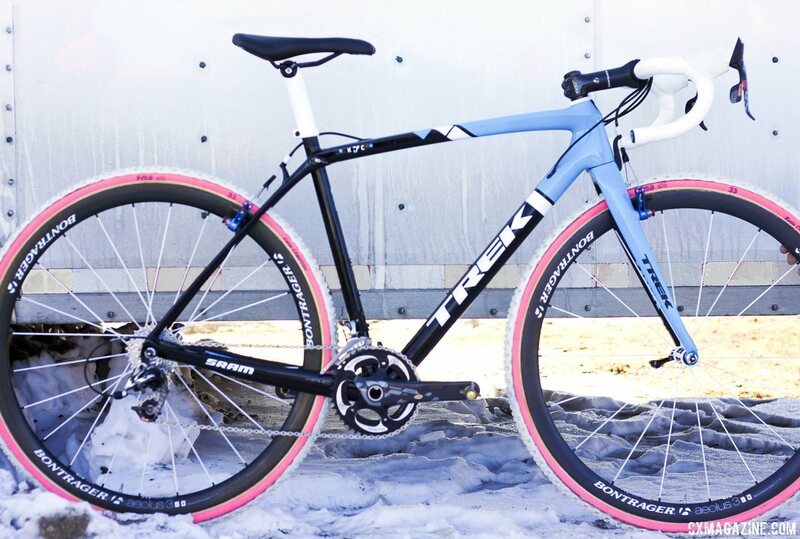 Also see the specs of her bike, and a weight as verified by Cyclocross Magazine. 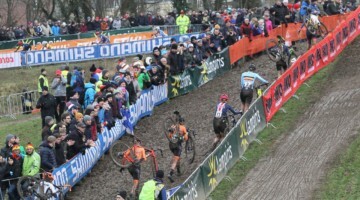 cyclocross Are you getting paid by Trek to advertise in editorial form? Seems like they’ve been name checked an inordinate amount lately. @gasperakcyclocrossNope. 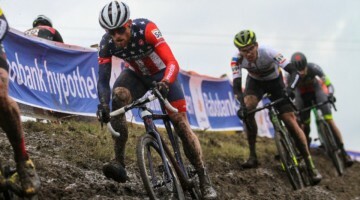 Not that we would turn down ad dollars from anyone who makes a cyclocross bike, but money doesn’t buy product editorial or reviews. Never will either. 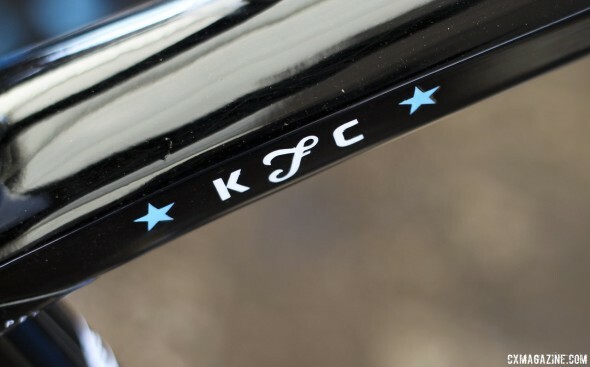 Did KfC have any need for the 34t chainring, coupled with that relatively wide range in the rear cassette? I didn’t watch the race or know the course but have a hard time imagining her needing to drop to the smaller ring.